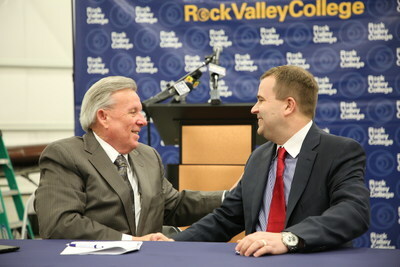 ROCKFORD, Ill., Jan. 15, 2019 /PRNewswire/ -- AAR (NYSE: AIR), a global provider of aviation services, and Rock Valley College today announced expansion of their unique aviation maintenance education and training partnership to further enhance instruction, students' job experiences and their career prospects at AAR upon graduation. AAR is a global aftermarket solutions company that employs more than 6,000 people in over 20 countries. Based in Wood Dale, Illinois, AAR supports commercial aviation and government customers through two operating segments: Aviation Services and Expeditionary Services. AAR's Aviation Services include parts supply; OEM solutions; integrated solutions; maintenance, repair, overhaul; and engineering. AAR's Expeditionary Services include mobility systems and composite manufacturing operations. Additional information can be found at www.aarcorp.com.